The Muppets cover “Bohemian Rhapsody” by Queen on YouTube! It’s part of their YouTube channel. 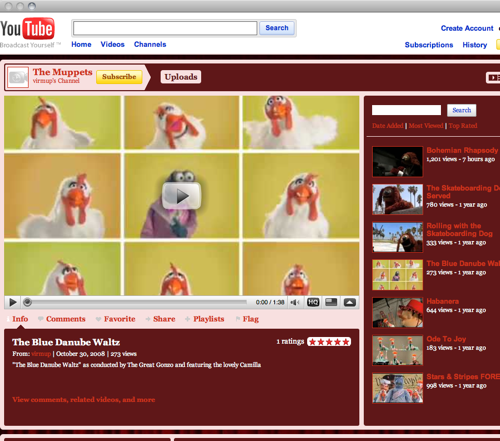 There’s also their own take on the dog-on-a-skateboard on-line video. When I was a kid I considered the position of Statler or Waldorf as a real career option. They are rumoured to be based on Jim Henson’s college professors. Now that I think about it, the only thing holding me back now is that I need a partner and a balcony. 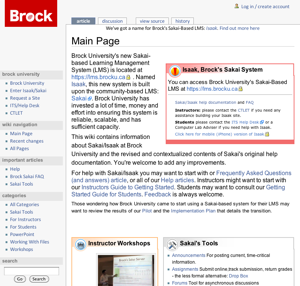 Brock University’s documentation for Isaak, Brock University’s Sakai-Based Learning Management System (LMS), is maintained within a wiki at kumu.brocku.ca/sakai. This wiki is intended to be a practical, readable, guide that is aware of the context that instructors use Sakai/Isaak for teaching at Brock University. What follows I had actually hoped to present on this at the last Sakai Conference. Brock University is not a member of the Sakai Foundation, but had intended to become one, as such the ambiguity made it hard to register. Brock University offers only a few on-line or distance courses and as such Brock’s LMS functions primarily as an additional channel of communication; content distribution; and community for otherwise face-to-face courses based at one of the two physical campuses. This amounts to slightly more than a thousand courses with faculty responsible for their own course spaces with complete control over it. The responsibility for assisting instructors in their development of on-line course content falls upon myself and the other important members of the Centre for Teaching, Learning and Educational Technologies (CTLET) at Brock University. The CTLET strives to offer a high level of support through: one-on-one consultations, workshops, E-Mail dialogues and phone-based support, but one thing is certain; every instructor cannot expect that when they need help with Sakai/Isaak that they can pickup the phone and get someone immediately. If the answer to every question about Sakai/Isaak could only be found at the other end of a telephone the ability to distribute critical information would be severely limited and it would represent a considerable bottleneck. Personal one-on-one help is important and very effective, but it is also resource intensive to deliver. University technical and pedagogical support staff work conventional business hours, however, instructors need not work from their office nor work conventional business hours. These are schedules and locations that do not always compliment each other. Today or any time that it cross your mind you should consider sending a message to our Canadian Forces members to let them know that you appreciate their service. You can send a quick message to them at www.forces.gc.ca/site/commun/message/message-add-ajout-eng.asp . I’m sure it makes a world of difference to the men and women serving and it only takes a few minutes. Regardless of your feelings about any one mission of the Canadian Forces you have to respect someone who at some point volunteered to risk their own life in the hope that it might protect the lives of others. 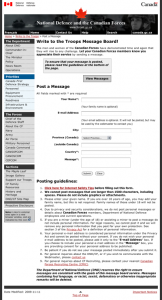 You are currently browsing the iMatt :: The Blog of Matt Clare weblog archives for November, 2009 .